The core objective of modern economies/governments is perpetual economic growth, driven by a belief this is a requirement to address our various social and ecological problems. Not only is objective impossible, it is in direct conflict with key social and environmental goals. Economics is not traditionally an area the environment movement has placed much focus, I belief this has been a major error. The structure and practise of our modern economies coupled with the prevailing, almost religious, belief that economic growth will be our salvation is arguably the most critical factor driving environmental destruction. It is important to appreciate that economics as practised today (neoclassical economics – NCE) is in fact incapable of transitioning humanity to a sustainable footing. Major economic reform is central to meaningful progress towards sustainability. Many (not all) attempts at establish a ‘green economy’ simply help mask the underlying faults in the system rather than challenging them. Current economics is focused on short-term profiteering, failing to properly account for economic and social impacts, and has seen environmental degradation accelerate despite the exponential growth in our understanding and awareness of the need to properly value natural systems. It promotes greed, individualism and violence when our true nature is actually rooted in cooperation, community and caring. There is a fundamental disconnect between the principles of our economic system and the way the physical and ecological world actually works. Worse still, NCE promotes the concentration of resources in the hands of a few and destruction of the commons. NCE assumes the environment is a subset of economics. NCE assumes endless economic growth is possible and desirable. NCE relies on perpetual growth for stability, it is locked into an endless growth paradigm. NCE makes consumer preferences central in decision making, promoting the needs and wants of consumers over environmental considerations that are neither part of, nor can be, part a free market-based system. NCE assumes the market organises society in a way that delivers the best of all possible worlds. The new economy needs to be built from the bottom up and take its guidance from the nature, of which it must be a complimentary subsystem. 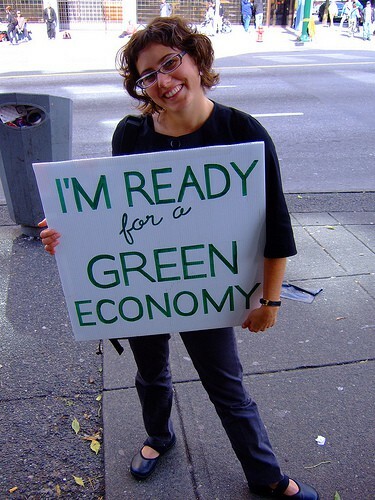 Our new economy must move from being a through-put economy to a zero-waste circular economy. It must move from GPD as its indicator of success to indicators of well-being and creative potential. It must focus on sustained yield over short term profits. It would favour local community-based control and ownership where impacts and benefits were realised locally. These operating principles would ensure each region would appropriately value its natural capital to ensure long-term sustainability. It is also through these mechanisms that the critical factors that our current economy does not and cannot value – our happiness, the sight of a glorious sunset, can be valued and protected. This may sound like a fantasy to many, but it is in fact rooted in the tried and tested principles that have allowed nature to flourish over millennia. A greater fantasy is that we can continue with the current system and not destroy the very capital that sustains us all. The missing ingredients for a shift to this new economy are sufficient awareness of the fundamental flaws in our current model coupled with a prevailing value system that is not centered in sustainability. Building local economies based on cooperation, creativity and respect for people and nature are a good place to start.